It might have come to the attention of many of you that I am completely incompetent when it comes to doing anything technical with my blog. It’s frustrating because I know what I want to do…I’m just too inept to do it. Anyway, today I made huge steps by becoming acquainted with “themes.” I still can’t explain exactly what a “theme” is, but the idea is that it makes blogs prettier. I chose one called MistyLook because I thought that it sounded nice and arty. Hope you like it! I am still stuck with this ugly “banner” at the top of my page though which shows a stupid, out-of-focus blade of grass with a raindrop on it. Anyway, my wonderful friend, Toby, offered to draw something along more of a food theme to go in its place. 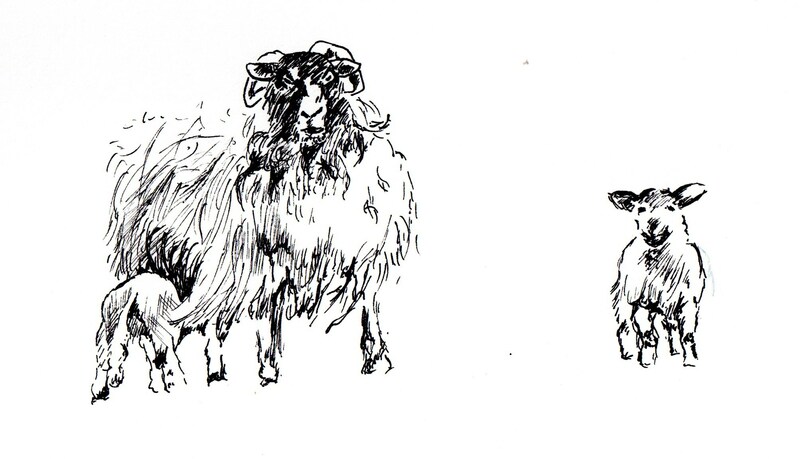 Earlier today he sent over this beautiful sketch of a ewe and lambs – it makes me feel a little bad that it’ll go under the header of “The Food I Eat” – despite being a self confessed carnivore, I don’t relish the thought of eating mummy sheep and her babies. Still, I’m very proud to have it on my blog – if anybody could help me move it to the right place on the page though, please drop me a line!